When you’re looking for a new jacket, it can be tricky to determine what classifies as a suit, blazer, or sport coat at first glance. Simply thinking about it stirs questions like: What is the difference between a suit jacket, blazer, and sport coat anyway? Which dress codes require a jacket and which ones don’t? What type of jacket is appropriate for each? Who am I? Am I truly happy? The nuances causing these questions are downright annoying, but if you want to get it right, buy the jacket you really need, look dress-code appropriate, and crush the fit we have your back. What’s the difference between a Suit Jacket, Blazer, and Sport Coat? When you walk into a store like Suit Supply, it can be hard to determine the difference between a suit jacket, a blazer, and a sport coat. Many retail associates when asked this question can barely answer definitively. Some say it’s based on formality, with Suits being the most formal, Sport Coats being the least and Blazers sitting in the middle. While this ranking is accurate, the difference really comes down to construction, fit, and fabric. The easiest way to separate a suit jacket from the rest is the shoulder construction. Suit jackets will have a bit more padding and you will also notice a bit of a bump at the seam where the shoulder meets the sleeve. This allows for a more straight drape from the shoulder to the elbow, giving it a more formal style. Conversely, the blazer and sporting jacket will have a shoulder/sleeve seam that looks more rounded like a shirt, with no padding. Beyond the shoulder, a suit tends to have more subtle details like the option of a ticket pocket and buttons that are made of (or resemble) horn that aligns to a more formal style. Blazers tend to have more flashy buttons (traditionally gold), and sport coats can have buttons made of or covered in leather. In addition, sport coats can have elbow patches and additions of leather at the lapel, under the collar, or at the opening of the sleeve. This is a simple one. Suit jackets are designed to be the most form-fitting out of all of the jackets as they are meant to be worn with a single collared shirt, or maybe a vest underneath. 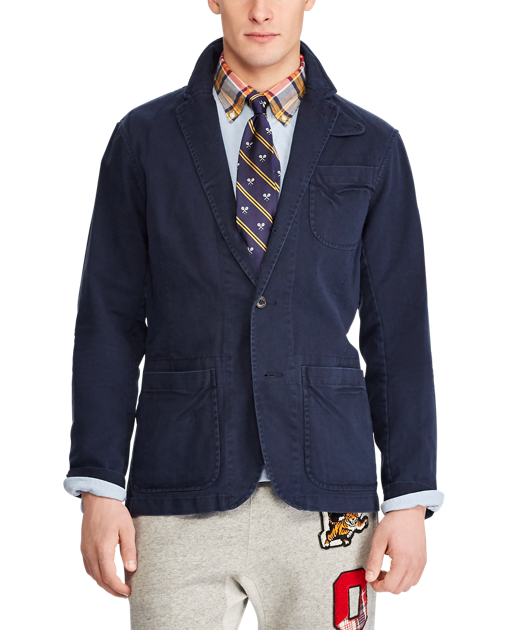 Blazers will be a little looser so you can throw it over more types of garments like a sweater. And finally, sport coats will be the roomiest, providing more freedom of movement since it has the word “sport” in the title, a.k.a shooting. Suits and blazers tend to be made of fine wool or wool blend. They will have a more luxurious drape and softer feel as to exude a sense of wealth or formality. Sport coats tend to be made out of tweeds, flannel or cotton blends. Think of it this way, suit jackets are made to impress and pair with pants from the same fabric, Blazers are still made to impress but meant to be worn with pants of a different color and fabric, giving more freedom to the type and colors of fabric used in their construction, and sport coats are usually made with thicker fabrics to be more durable and more outdoorsy to protect the wearer from the elements and cooler temperatures. Below we have a simple break down of 9 different dress codes and what type of jacket is appropriate for each. Here are examples of each should you choose to cop something for your closet. A classic Suit jacket with paired pants. A killer blazer for any occasion. Self-confidence is a hard attribute to build if you’re not sure how it works. We break down what self-confidence is and how you can manifest more of it for yourself in this edition of The Man. Guest Post: Fewer Layers, Same Flair! This guest post from Brian over at Gent-Life.com is all about the transition to warmer weather clothes. Get inspired, and check out some of his suggestions on how to make your Spring wardrobe really pop. It's Steve's (our founder) Birthday this week so we let him post whatever he wanted. He came up with a story about a dream he once had and a pretty good call to action. Not bad Steve. HBD. Beckett Simonon sent us some new oxfords to test out and… damn. They take their time with their shoes, focusing on quality over speed, and it shows. Check out our full review! We teamed up with the guys over at CoffeeorBust.com to give you a simple yet thorough brew guide for the most common in-home brewers. Don’t settle for burnt coffee that costs $5 per cup, make your own morning joe and drink coffee you know you will enjoy. Everyone does a “love languages” post for Valentine’s Day, so we decided to mix it up and do a date planner mad-lib style instead. Insert yourself in our date scenario and get some killer ideas for your heart-shaped date night this year. We are answering the confounding question of “what kind of bag do I get for work?” The classic battle of Backpack vs. Briefcase goes down in this article and you’re the winner. We go over some tips and tricks of how to get on the good side of the older manager you work with day to day. Don’t fight ‘em, adapt and have them on your side in no time. The oldest material man has used to make clothing. Find out what leather really is, it’s impact on the people who make it, and what to watch out for. How Could I Possibly Be Happy? People keep asking me if I’m happy now that I don’t make a ton of money, and the answer yes. Here is how I got out of the money=happiness cycle and live the life I want: a happy one. If you must suffer through the watching of awful Hallmark-style Christmas movies, we have made a guide for which ones to avoid, and what to pay attention to, oh and a drinking game for all of them. The perfect 2018 holiday gift guide for men. A great starter list of gifts for six common types of guys. If you are a consultant, listen up! These are our top picks for office pants, categorized by dress code. Find your home office and client-site style, then check out our selection of go-to trunk covers. Your job is hard enough, dressing yourself shouldn’t be. Dating today has a lot of nuance, and a trend that has been popping up thanks to dating apps is the passive pass of Ghosting. We go into what it is, when to do it, when not to, and how it affects those we date. The mercury is dipping pretty low, which means it’s time to start thinking about what your new Fall jacket is going to be for the transitional season. We have put together options fro work, play, and in between. Who knew there were so many variants of Rayon used in clothing. Find out what Rayon is made of and what it means when you see it on your tags. This is a new series called Seriously Gents where we dive into serious topics and issues facing millennial men, offering some perspective, and some advice in an attempt to bring harder topics to light and hopefully improve our society. This episode we discuss sexual harassment, what it is, what it looks like, and what we can do individually to reduce its prevalence in our culture.